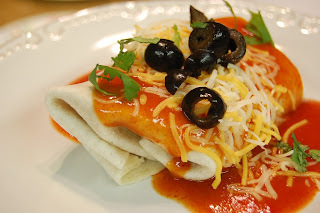 When I saw the picture of Chicken Wet Burritos over at FOODIE, I put it on the list to try soon. We love soft tacos. It one of the kid's favorite meals. Since this utilized all the same flavors but with a fancier presentation, I knew it would be a hit. And it was, even if I had to change it up a bit. I got a bit sidetracked while making the sauce. (Three kids needing my attention, two hungry dogs begging to eat and two crazy cats racing back and forth under my feet, all while trying to set the table and prepare dinner. You think I'd be used to it by now!) I left it turned to high and then forgot all about it. Lets just say the pan was not pleasant to clean. Luckily I had a can of enchilada sauce in the pantry. I heated it up and we were good to go. I was right. It was a hit. I had more chicken than we ended up using so I used the leftovers in a delicious Tortilla Soup the next day. Yum! I can't wait to make Chicken Wet Burritos again and actually pay attention to the sauce this time! In a medium saucepan heat oil, add flour, smoothing and stirring with a wooden spoon. Cook for 1 minute. Add chili powder and cook for 30 seconds. Add stock, tomato paste, oregano, cumin, and salt. Stir to combine. Bring to a boil, reduce heat to low and cook for 15 minutes. The sauce will thicken and smooth out. Add the honey and sour cream and adjust the seasonings if needed. Keep warm until you're ready to ladle it over your wet burrito. Start by cooking your chicken in a bit of olive oil until cooked through. No need to even season the chicken at this point because it will be seasoned later when it's mixed with the vegetables. Remove the chicken from the pan and set aside. In the same pan, heat some more olive oil if needed, then add the onions, bell peppers and garlic. Saute for a minute or so, then add most of the tomatoes (reserving some for garnishing the burrito), cilantro, cumin, salt, and pepper. Stir to combine. While that's cooking, quickly chop up the cooked chicken and add it to the pan along with the juice of 1 lime. Cook for a few minutes more and it's done. Pop the flour tortillas into the microwave for 30 seconds or until they're warm, soft, and easy to bend and work with. Quickly spoon some of the filling into the tortilla, fold in the sides of the tortilla, then roll the tortilla enclosing the filling inside. Do this with the other four tortillas to make four burritos. Ladle as much sauce over the burritos as you like, then top with some of the shredded cheese immediately so it can start to melt. Garnish the burrito with slices of avocado, the rest of the tomatoes, sour cream, and a sprig of cilantro. Serve with a knife and fork. Makes 4 wet burritos. Looks good - for real! We call these suizo around these parts over here...but whatever you call it - it looks great!